Observational studies indicated that resting heart rate (RHR) was associated with diabetes mellitus (DM) risk; however, it remains unclear whether the association between RHR and DM is causal. We aimed to examine whether there was causal association of RHR with DM risk. A prospective study including 16,201 middle-aged and older Chinese (7031 males and 9170 females) derived from the Dongfeng-Tongji cohort was performed. Cox proportional hazard regression models were conducted to estimate the associations between RHR and incident DM risk. In 7481 participants, 65 single nucleotide polymorphisms related to RHR were genotyped. A genetic risk score (GRS) of RHR was calculated based on the RHR-associated variants. The causal associations of RHR with DM risk were investigated by Mendelian randomization analysis. 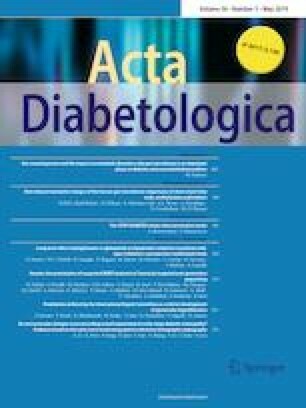 During a mean (SD) follow-up of 4.5 (0.5) years, 1110 diabetes were identified. Compared with the referential RHR group (≤ 60 beats per minute [bpm]), individuals with RHR > 80 bpm have a higher incident diabetes risk, with a hazard ratio of 1.40 (95% confidence interval [CI], 1.05–1.88). With per SD increase in the weighted genetic risk score, the resting heart rate increased by 0.71 bpm (95% CI 0.49–0.93). By using the GRS to estimate the unconfounded effect, we found that higher resting heart rate did not have a causal effect on diabetes risk (OR 1.00 [95% CI 0.95–1.05]). The present study supported a positive but not a causal association of RHR with incident diabetes risk. More studies are needed to verify our findings. The online version of this article ( https://doi.org/10.1007/s00592-019-01344-3) contains supplementary material, which is available to authorized users. The authors would like to thank all study subjects for participating in the present DFTJ-cohort study as well as all volunteers for assisting in collecting the samples and data. This work was supported by the grant from the National Natural Science Foundation (Grant NSFC-81522040 and 81473051); the Program for HUST Academic Frontier Youth Team, and National Key R&D Program of China (2017YFC0907501). All procedures performed in studies involving human participants were in accordance with the ethical standards of the institutional and/or national research committee and with the 1964 Helsinki declaration and its later amendments or comparable ethical standards. The study has been approved by the Ethics and Human Subject Committee of the School of Public Health, Tongji Medical College, and Dongfeng General Hospital, the Dongfeng Motor Corporation (DMC). All study participants provided written informed consents.